MIAMI, FL – It’s simply an event like no other held in the country. 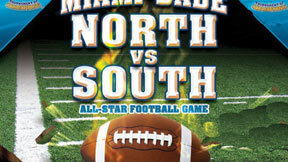 The 21st Annual Miami Dade High School All-Star Football Game (North vs South). Various events kick off a weekend of celebration and competition by Miami Dade’s 100 best high school football players. The most prestigious area in the country, the hotbed for high school football talent, will once again shine in the spotlight as the 21st edition of the Tournament of Champions Miami-Dade High School All-Star Football Game on Saturday, Dec. 19 at Curtis Park (1901 N.W. 24 Ave.) in Miami. The game, which had long featured the best of Miami-Dade and Broward – and most recently – other athletes from southeast and southwest Florida – has returned to its roots this year with a showdown between the best of 305 – where the lines are drawn and the county is split into North and South. The Warren Henry Miami Dade High School Player of the Year Presentation will be Friday Dec. 18 @ 11a.m. at Warren Henry Dealership on 441. *Fashion show by designer Tanya Marie McClendon of Miami. Proceeds from this year’s soiree benefit the “Give Me Dignity Foundation” speaking out on sexual abuse of children in the Caribbean. All-Star Game Kickoff is 7 p.m. and tickets are $12. For in-formation, call 305-910-9010. The head coach for the South is David Cooney from Southridge and the North head coach is Darryl Heildberg of Miami Norland. In addition the North vs. South All-Star event, the day will start off with a prestigious underclassmen combine that will feature some of the best up-and-coming football prospects the entire south Florida region has to offer. The combine will be the first forum of the off season to get rising seniors, juniors and sophomores into the spotlight. Every player that attends will be listed and promoted along with player evaluations and videos that they have had from this past year. This is a chance for many underclassmen in Miami-Dade, Broward, Monroe, Collier and Palm Beach to come down and get on the map. Players attending this event will get out there for all to see and start the ball rolling for the upcoming season. For information call (305) 910-9019.